Dog collar (fabric applied to heavy-duty webbing) with removable bow tie. 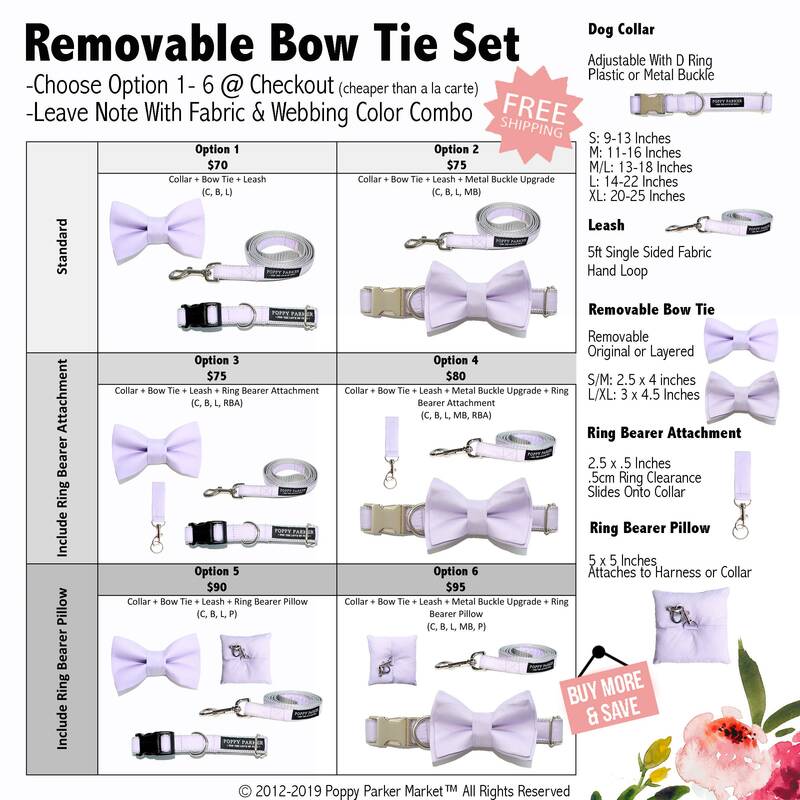 Depending on your combination selected this order may include a matching dog collar with d-ring, removable bow tie, 3ft or 5ft (default) single sided leash with snap hook and hand loop, metal buckle upgrade, ring bearer ring attachment, and/or ring bearer pillow. --STEP 2: CHOOSE COLLAR SIZE: (S, M, M/L, L, XL, Add Neck Size) If you choose 'Add Neck Size' please leave a neck/collar measurement in notes at checkout. By choosing this option we will be able to tailor the size of the collar for a perfect fit. We recommend taking a quick measurement of your pet’s neck for the best fit. Just add a note at checkout or Etsy convo us with the size within 24 hours. --STEP 3: SPECIAL REQUESTS: Please leave a note at checkout if you want a different fabric color, mix and match colors, different leash length, or have an approaching due date. We are fully customizable. We want to provide you with a high quality pet product that will perfectly match your wedding or everyday needs. Additionally, we have carefully constructed our products to deconstruct so they can be removed, ironed, or placed anywhere on the collar. For example, the bow tie deconstructs so you can clean and iron it to keep it looking new. It is also removable so you can place it anywhere on the collar for a different look (front for boys, side for girls) or remove it all together. We offer a comprehensive selection of solid colors to match your wedding or event. 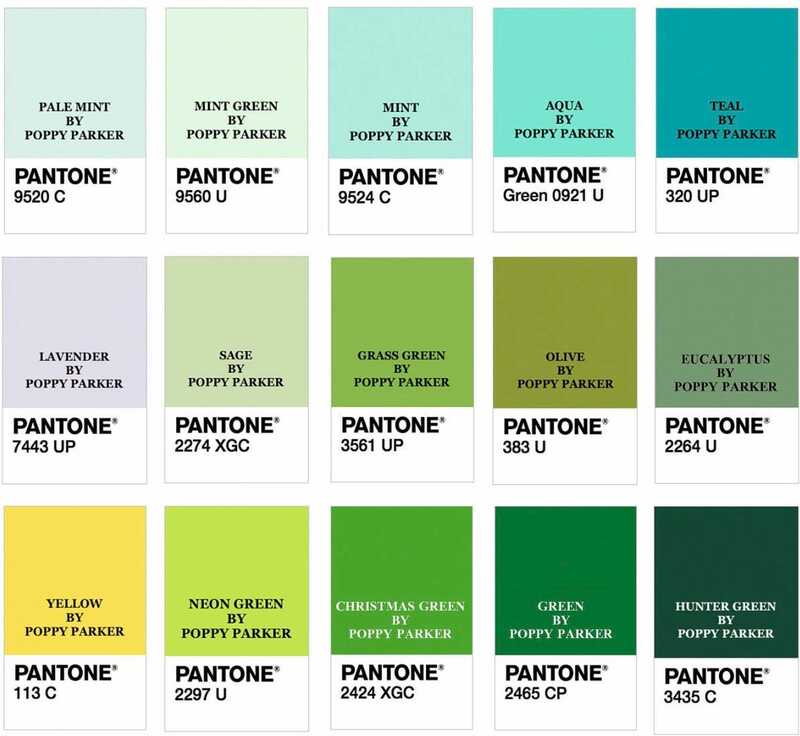 On our color grid you will find a rough match to Pantone. 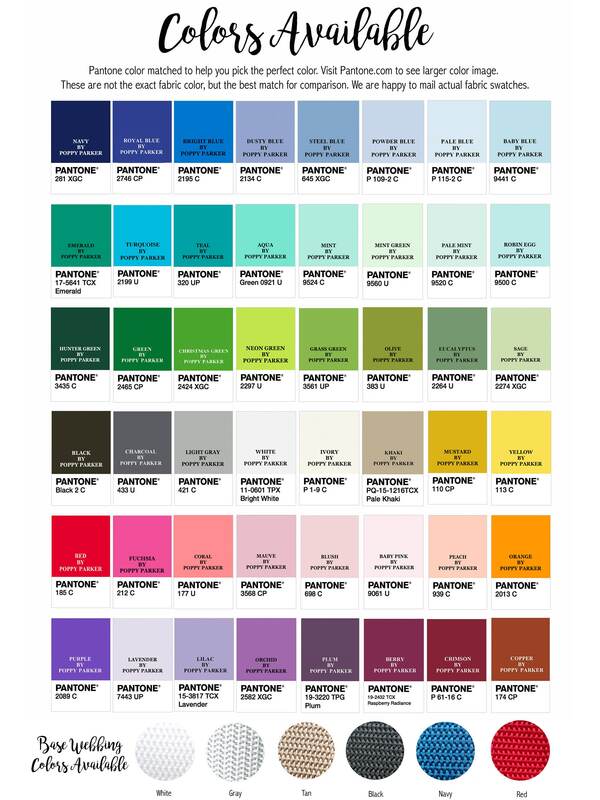 We are not affiliated with Pantone, but offer color match to help identify the best match. Visit https://www.pantone.com/color-finder to enter the Pantone Color. All orders are made to order. This allows us to offer whatever combination of products you need in the colors you want. Production time varies from 3 business days to 2 weeks depending on volume. Please allow for production time plus shipping time for delivery. We recognize that most of our customers are planning a wedding with an approaching deadline. We will do everything possible to meet these deadlines, but request an email or note with your deadline information so we can adjust our production timeline. Our products are made with high quality materials and have reinforced stitching to withstand normal wear and tear. However, as a responsible pet owner please check for aging and discontinue use if seams are coming loose. LOOKING FOR MORE INFORMATION, PHOTOS, SALES, OR QUESTIONS? --Sent us an Etsy convo or email us at poppyparkermarket [!at] gmail.com we would love you hear from you! Add Neck Size: We will tailor the collar so that it is adjustable within noted size. Collar includes buckle, “d” ring to attach leash, and adjustable slide. 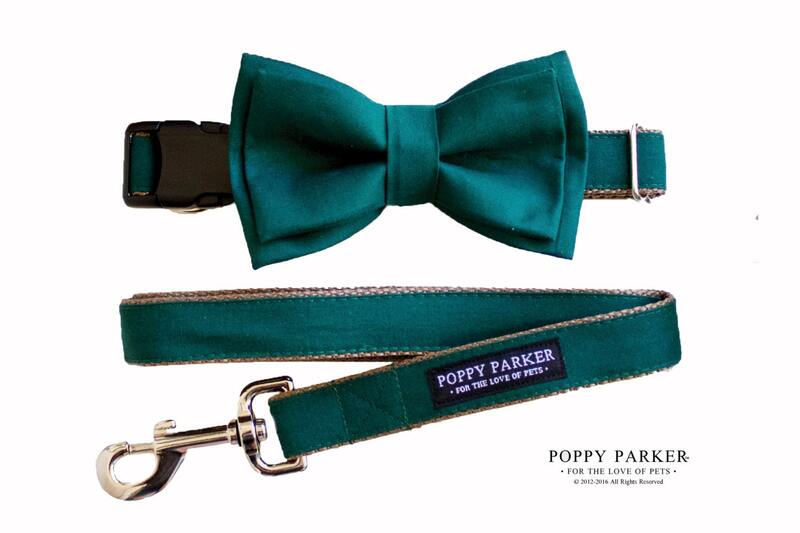 Bow tie is removable and can be placed anywhere on the collar. Layered Bow Ties are slightly larger. Service providers. I engage certain trusted third parties to perform functions and provide services to my shop, such as delivery companies. I will share your personal information with these third parties, but only to the extent necessary to perform these services. Compliance with laws. I may collect, use, retain, and share your information if I have a good faith belief that it is reasonably necessary to: (a) respond to legal process or to government requests; (b) enforce my agreements, terms and policies; (c) prevent, investigate, and address fraud and other illegal activity, security, or technical issues; or (d) protect the rights, property, and safety of my customers, or others. I may store and process your information through third-party hosting services in the US and other jurisdictions. As a result, I may transfer your personal information to a jurisdiction with different data protection and government surveillance laws than your jurisdiction. If I am deemed to transfer information about you outside of the EU, I rely on Privacy Shield as the legal basis for the transfer, as Go Daddy Bookkeeping is Privacy Shield certified. Collars are adjustable with the listed approximate range. Is The Bow Tie Removable? Yes! 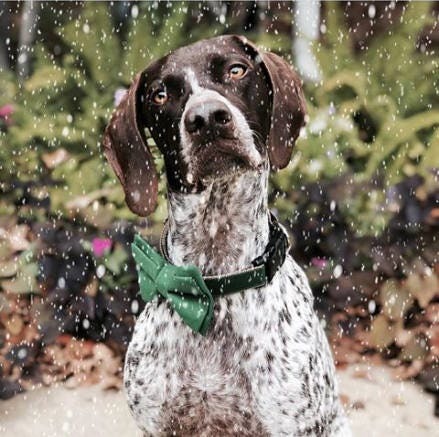 The unique design of our patient pending bow ties offers more versatility then the traditional pet bow ties on the market. 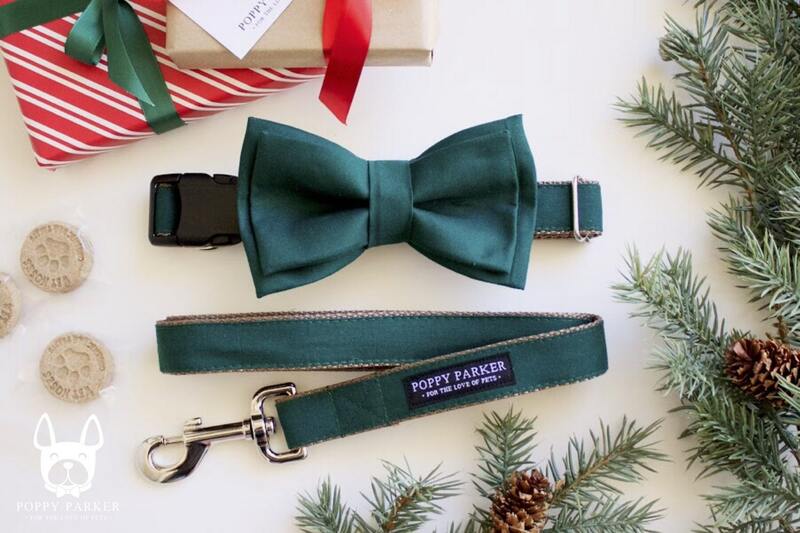 Our design allows for deconstruct of the bow tie for cleaning, touch up ironing, and versatile placement on the pet collar. Bandana is removable and slides onto collar. Washable. My Wedding Is Next Week Can You Help? Yes! Our shop focuses on weddings and events so we totally understand needing every last detail to be perfect. We keep very little ready to ship stock on hand but, will turn custom orders right around next day if possible. Just shoot us an email for rush availability. What Is The Current Production Time? We are currently producing orders ready for shipment in 3-5 days, but this is always subject to volume variations. We guarantee all orders will be shipped within 14 business days. Please contact us if you have any concerns, we are always happy to work with deadlines! Very well made. Perfect for our dog on our wedding day. The color was more hunter green than teal (which is what it looks like on my computer screen, which was exactly what I was hoping for. My bridesmaids were in hunter green and it was perfect. Wedding party dogs! Also bought collar from your company for our wedding. Great customer service. Quality collars. Great colors. Well made. Would recommend! This was perfect for my wedding- matched my bridesmaid dresses exaclty! Excellent quality and arrived quickly! High quality! Going to be handsome on my Golden Irish!! !